It will be out on 10 November, 2009. I loved Rutherfurd's Russka and London. 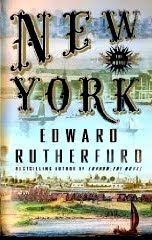 Both Edward Rutherfurd and James Michener rank as my top historical novelists. I look up to them and their work has inspired me greatly. I love being swept away into the dramatic story of family generations, through their passions, conflicts, loves, struggles, genius and indirect relationships with historical figures. I enjoy reading about people's lives while witnessing their city's or country's development as if I were present at that time. It is a wonderful way to time travel and an entertaining way to learn about history. Rutherfurd, educated in Cambridge and Stanford, is a master at weaving well researched historical fact with enthralling fiction. I just can't wait to get my hands on New York: The Novel. Only two weeks to go! My top wish for Christmas.